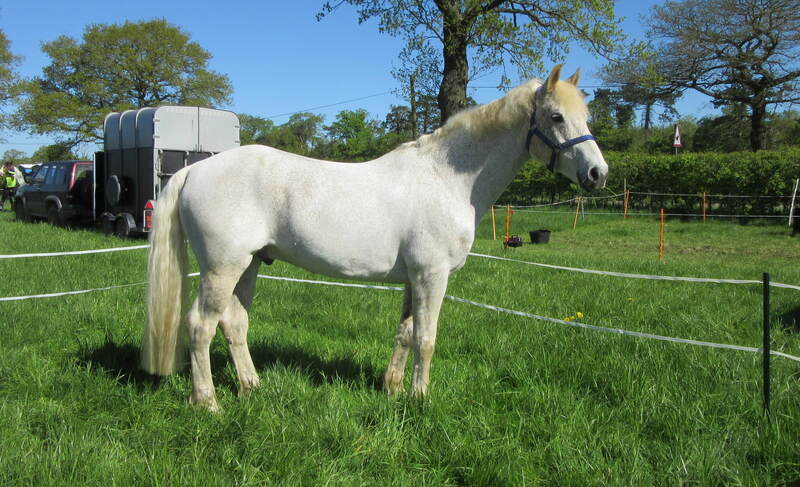 I decided to buy a new horse this spring (my lovely mare, Lily, is now affected by arthritis in her knee). On March 8th I took delivery of Derry Prince, a 10 year old Connemara who had been doing some eventing in a Pony Club home. I booked onto all the TREC training I could find nearby – 3 arena training sessions, 1 arena TREC and a POR only competition. I aimed to keep everything fun for Derry as he found it all rather new. Fortunately he is a quick learner and likes to bond with his owner. 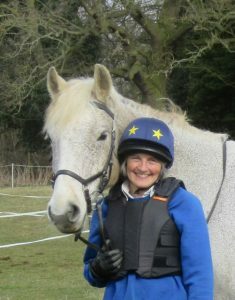 I am still a bit nervous in open spaces (Bella and I had a rather mad uphill canter on our first hack out together!) but am becoming more confident with him over time. We arrived at Park Farm on the Sunday morning and set up a day corral. Derry was fascinated by the first riders heading off down the road. For his first TREC we were competing at Level 1 with my regular pair, Bella, and her horse Colin who now has a year’s TREC experience. The riding at Park Farm is always lovely. As the weather had been very wet beforehand the speeds had been set fairly low so we could walk and trot the POR and enjoy the views across Northamptonshire. The canal boats were a new sight for Derry – he went into ‘giraffe’ mode when he saw one gliding along behind the bushes on the far side of the field. We had six of the PTV obstacles spaced along the POR which seemed to work well I think. The remainder of the PTV obstacles were along part of the UK Chasers course and followed immediately after the POR course so our body protectors had been transported to this point. We dumped the saddlebags and donned body protectors. There was a bit of a backlog of competitors waiting – giving me time to get a bit nervous about the open space/cross-country jump situation with my new horse. Fortunately Jill Crawford and her horse Elsie were a lovely calm influence for us when Bella and Colin set off to do the PTV first. I didn’t dare ask Derry to canter along the PTV so he did extra large trot! But he had a go at everything – he thought the neck rein was very strange but then remembered the obstacle we had practised at home. He jumped two jumps out of trot and trotted through the low branches too. I asked for canter after the last obstacle and we had a nice controlled canter through the finish to where Bella and Colin were waiting for us. The MA was in the arena at Park Farm in a rather elegant spiral shape. Derry was well behaved and did a good slow canter. He stayed in walk but was a bit tight – he should score more when we are both more relaxed. When I put Derry back in his corral he told me he was very worried because Co lin was about 3 lorries away! When he wouldn’t settle, and seemed likely to jump out of his corral, Bella and I decided the best thing was just to move the corral next to Colin’s. He will soon learn to take things more calmly so we don’t need to do everything in the first weekend. 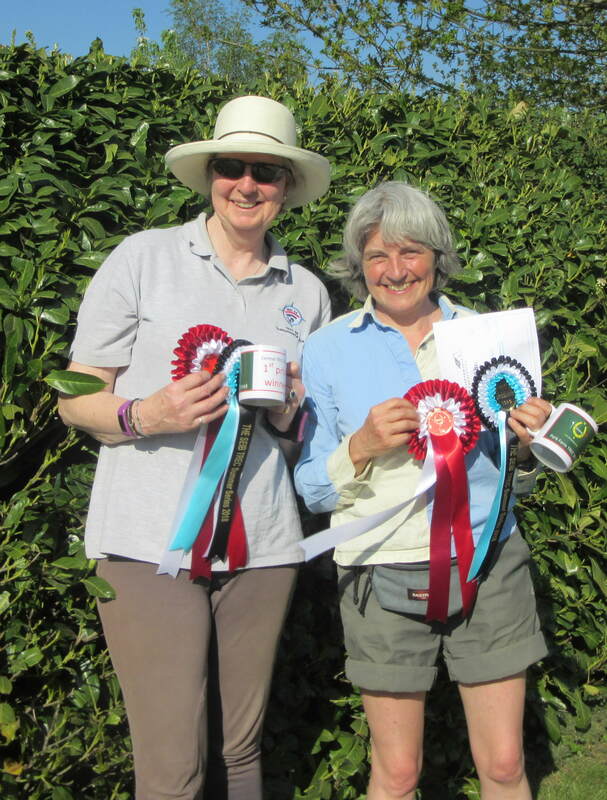 We had tea and hotdogs whilst waiting for the other competitors to finish and for the preliminary scores followed by prize giving. I’m pleased to say that Bella and I won our class (which is why I got asked to write this report!) We were also delighted to find that the class prizes had been donated by Performance Equestrian and we had won a bridle each! What a lovely way to start the 2018 summer TREC season.